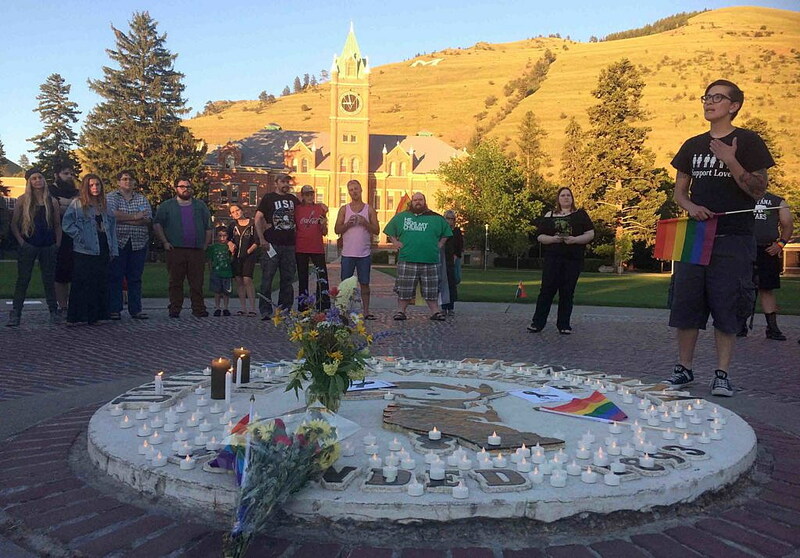 Embracing their partners and friends, more than 200 people stood around the Oval on the University of Montana campus on Sunday night to light candles and reflect on the loss of life resulting from the largest mass shooting in the nation’s history. Bennett, the first openly gay male legislator in the state of Montana, addressed a crowd waving colorful LGBT flags and illuminated in soft candlelight. The gathering stood around the Oval in profound silence, even as the clock struck 9 p.m. The shooting in Orlando, which left 49 dead and at least 53 wounded, renewed the national debate over guns, Muslims in America and the nation’s tolerance for mass violence. 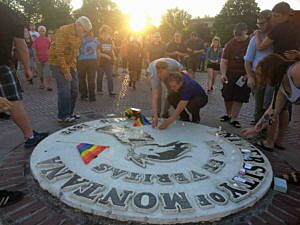 But for members of the LGBT community, it also renewed their push for acceptance. While they stood thousands of miles away from the Pulse Nightclub where the shooting occurred, many members of the LGBT community in Montana still felt as if they were a target. If not this weekend, they said, then perhaps some other day. Spurzem took aim at the perceived intolerance expressed by some candidates running for political office in Montana. She and others present on Sunday night fear that certain Republican office seekers will move to kill nondiscrimination polices covering sexual orientation and gender identity, and work to add a so-called “bathroom bill” to state law. Several recent governors, including Marc Racicot, Brian Schweitzer and serving Gov. Steve Bullock, each issued an executive order widening the state’s nondiscrimination provisions to cover sexual orientation and gender identity. But the Legislature, held by a GOP majority, has attempted to wind it back and restrict cities and towns from adopting policies not currently in state law. Such intolerance amplifies the events in Orlando, Spurzem believes. Marcus Ordane, who identifies as transgender, agreed. Sunday’s crowd placed flowers and candles on the Oval and signed their thoughts to posters reading “Get Better Orlando” and “We Are One.” Given the nation’s political climate, however, some urged caution, suggesting that events in Orlando would politicize several firebrand topics, including guns, Muslims and gays. “Actions like this come from people not understanding each other and being polarized,” said Reid Reimers of Missoula. “This issue has to do with the LGBT-plus community, but it also has to do with Muslim Americans, it has to do with gun violence, and these are all polarizing issues.